Home Gratitude How Many Dots Have You Connected? In order to connect the dots of our spiritual journey, we must stop lying to ourself about where we need to heal. When you no longer dwell on what you used to dwell on, the dots have been connected. Until this day comes, there is work to do. If your spiritual progress has been slow then perhaps it is time to take a different perspective on the darkness of your life. Where have you been hiding in the shadows, how are you not taking care of yourself and what untruths are you convincing yourself of, in order to feel happy? We compromise our integrity so often and on so many levels, the truth becomes buried so deep inside of us, eventually it puts us at odds on where to search for it. We should remind ourself how important we are, not only to ourself but to the people who love us. Consider yourself as a bottle of fine wine, but remember, the kind of grapes it takes to make the finest of wines have to be earned with a lot of hard word. Consciousness takes patience, careful consideration, compassion and honesty, if you want to become more aware of what it is that is blocking you from moving forward, then just like the making of fine wine, you must be able to identify the unsatisfactory grapes, and pull them out. Unhealthy patterns are no different, recognizing where you are compulsive with your actions and behaviours, is the key to knowing where the healing still needs your attention. Letting go is being able to see what needs to be pulled out from the shadows and released. Connecting the dots of our life experience takes a lifetime, consider this when you feel like you haven’t made any progress at all, don’t be so hard on yourself. 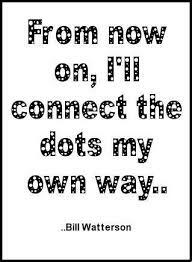 You have connected more dots than you realize, often we don’t give ourself credit enough for our inner beauty.